The Swedish Equestrian Awards Gala was incorporated into the centenary celebrations and Queen Silvia presented the honorary lifetime achievement award to Official International Judge and Honorary FEI Bureau Member Eric Lette. Ulf Rosengren, organiser of the FEI World Equestrian Games 1990 and the Stockholm Horse Show the 2012 edition of which kicks off today, was honoured as the organiser of the century. The Swedish Equestrian Federation was established in 1912, the year when equestrian sport made its first appearance on the Olympic programme at the Games of the V Olympiad in Stockholm. Sweden is not the oldest National Federation, however. That accolade goes to Belgium whose Comité Central Hippique Belge was created in 1898. 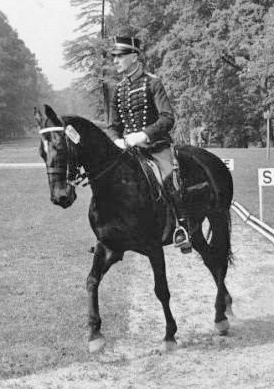 Count Clarence von Rosen, Master of the Horse to the Swedish King and IOC member, had been campaigning for the introduction of equestrian sports in the Olympic Games since 1906. Baron de Coubertin and many IOC members were supportive and, after Stockholm, when Count von Rosen was given the task of organising the 1912 Olympic Games, the inclusion of equestrian sport was undisputed. It was also Count von Rosen who proposed the three Olympic disciplines of jumping, dressage and eventing that are still used today. Nine years later in 1921, Sweden was one of the eight founding members of the FEI. In 1956 the Olympic equestrian events returned to Stockholm, when it became clear that, due to Australian veterinary restrictions and a six-month pre-shipment quarantine, they could not be organised in Melbourne. Count von Rosen was once again appointed as president of the executive committee. Following his death in August 1955, the year before the Games, former Olympic rider Arne Francke took over the post. Stockholm is one of only three cities – the others being London and Los Angeles – to have twice played host to the Olympic equestrian events. Sweden was instrumental in the creation of yet another milestone in the history of international equestrian sport when in 1990, over 420 participants from 37 countries gathered in Stockholm for the first edition of what has become the FEI’s flagship event: the FEI World Equestrian Games. For the first time the world championships in all the FEI disciplines were held concurrently in the same city. The Stockholm 1990 FEI World Equestrian Games were a triumph for equestrianism and proved a turning point for the sport’s global growth. Sweden is shown in dark green within the European Union (EU) in light green. “The contribution of Sweden to international equestrian sport is immense,” said FEI Secretary General Ingmar De Vos. “We are proud that our Olympic history began in a country which loves and understands horse sport. The Swedish have always been one of the world’s leading equestrian nations and were one of seven countries to send full teams in all three Olympic equestrian disciplines to this summer’s London Olympic Games. Sweden has participated in the equestrian events of all of the Olympic Games since 1912, except for Mexico 1968 and Moscow 1980. Tinne Vilhelmson Silfvén is the Swedish rider with the most Olympic participations. She has competed in dressage at all the editions of the Olympic Games since Barcelona 1992. Henry St-Cyr is the Swedish rider with the most Olympic medals. He won four gold medals in dressage – two team and two individual – at the Helsinki 1952 and the Stockholm 1956 Olympic Games. He pronounced the Olympic oath at the opening ceremony of the 1956 Olympic equestrian events in Stockholm. Sweden was one of seven nations represented by teams in all three Olympic equestrian disciplines of jumping, dressage and eventing at the London 2012 Olympic Games. The other nations were Australia, Canada, Great Britain, Germany, the Netherlands and the USA. From 1912 to 2012 Swedish riders have won a total of 41 Olympic equestrian medals: 17 gold, 11 silver and 13 bronze. Sweden has participated in the equestrian events at all the editions of the Paralympic Games since the sport’s inclusion in the Games programme in 1996. Swedish athletes have won three Paralympic medals: two gold and one bronze. Sweden has participated in all the editions of the FEI World Equestrian Games and hosted the first running of the multi-discipline event in 1990. Gothenburg has hosted the FEI World Cup Jumping Final 12 times (1979, 1982, 1984, 1986, 1988, 1991, 1993, 1995, 1997, 1999, 2001 and 2008). The Rolex FEI World Cup Jumping Final 2013 will take place in Gothenburg from 24-28 April. Gothenburg has hosted the FEI World Cup Dressage Final six times (1989, 1992, 1994, 1996, 1998 and 2003). The Reem Acra FEI World Cup Dressage Final 2013 will be organised in Gothenburg as well from 24-28 April. In 2012 Sweden organised 22 FEI events in jumping, dressage, eventing, driving, and endurance. The HSBC FEI European Eventing Championships 2013 will take place in Malmö (SWE) from 29 August to 1 September. Swedish Olympian Peder Fredricson was the winner of the recent FEI Facebook pictogram design competition.